23.07.12 – Judit Polgar celebrates her 36th birthday today with the news that she’s confirmed her participation for the 4th London Chess Classic, at Kensington Olympia, 1-10 December, 2012. Polgar now joins World No 1 Magnus Carlsen, World Champion Vishy Anand, World No 2 Levon Aronian, the defending champion Vladimir Kramnik, and the UK No 1 Mickey Adams as those that have so far confirmed their invitations to play in the year-ending elite chess spectacular in the Capital City. 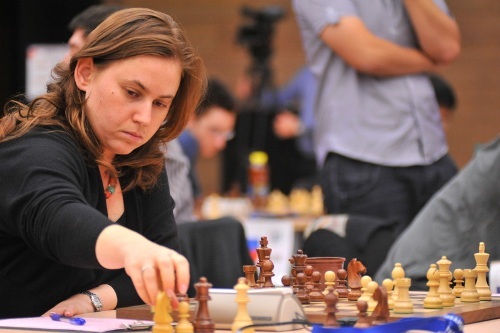 Judit Polgar is by far the strongest female chess player in history. In 1991, she achieved the title of Grandmaster at the age of 15 years and five months, the youngest ever to do so at the time, as she beat a 34 year age record set by a certain Bobby Fischer. Judit has never played in women’s tournaments or indeed for the Women’s World Championship. “I always say that women should have the self-confidence that they are as good as male players, but only if they are willing to work and take it seriously as much as male players,” she once commented. And over the years, Judit – now a married mother with two children, Oliver and Hanna – has proved that women can indeed break the glass ceiling to gain entry into the most exclusive clubs: She has been a frequent visitor to the world’s top ten and was the first woman in history to play in a Candidates Tournament. And along the way, she’s defeated nine current or former world champions in either rapid or classical chess: Karpov, Kasparov, Spassky, Smyslov, Topalov, Anand, Ponomariov, Khalifman, and Kasimdzhanov. As they would say in the animal world, the female can be the deadlier of the species – and Judit Polgar, with her very aggressive attacking brand of chess, is highly capable of being deadlier at the board than the rest of the male field at the London Chess Classic!